Does this really not just about say everything...? 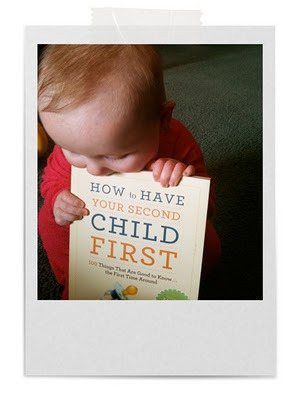 As part of my own 'Get A Life' project, I wanted to re-read How To Have Your Second Child First by Kerry Colburn & Rob Sorensen. I bought this when I was pregnant after reading about it online. I laughed the whole way through it and Mr S and I picked up some great tips. We wanted kids for a long time and therefore we had a long to talk about the kind of parents we wanted to be. We both grew up in country NSW where in summer we were allowed to roam (relatively) free and be home by sunset. So we talked out every possible scenario and I thought we had it down. But I rudely realised that plans are great, but executing such level headed decisions when you wake up every morning feeling like you've drunk three bottle of cheap tequila is difficult. I've bent the spine back and forth and earmarked pages I think are useful. But what I've found the most useful is going back and re reading parts as Millie grows and changes. I think this technique applies to most parenting books. It's nice to read and memorise but you'll always find something relevant if you go back time and time again. Colburn & Sorensen go on to discuss how your baby doesn't actually need you to interact with them ALL the time. It's healthy for them to discover things on their own. I remember being completely oblivious to the relationship that Millie had with Lucy the cat until one day she rolled over and made cooing sounds and grinned at her. Or how Millie's worked out how to lever a giant plastic jar out of her toybox this week. Another favourite is #71 - A Sense of Humour Can Really, Really Help. I'll tell you a story... When Millie was around six weeks old and I was having a bad day. I'd sobbed all through the morning holding a grumpy baby who didn't have enough sleep either and the day was bleak. She needed a nappy change mid feed and had just begun to produce enough poo for every infant in Huonville nappies that required careful attention. All clean, nappy about to go on, and I leant in for closer inspection double check. I didn't even hear a noise but suddenly there was poo on my trousers, the floor, my open shirt, my chest and... in my bra. I actually said aloud 'I don't know what to do next.' 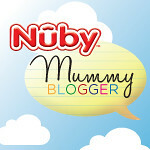 Clean nappy for Millie and a stern warning that she was going in her bouncy chair because MUMMY WAS HAVING A SHOWER AND THAT WAS THAT. Then, I started laughing at the sheer ridiculousness of it all. And Millie sat in her bouncy chair in the bathroom and I kid you not, giggled at me the whole time. Mr S and I laughed so much in those first few weeks, and even more now, but it was especially important in the beginning, because sometimes it was so crap if I didn't laugh I would never have stopped crying. There's also endless amounts of such practical information such as keeping a box in the car with spare nappies, towels, non perishable snacks for you, a book for you, a toy for bub etc etc, should you be caught with an understocked nappy bag... I'm looking at you Mr S.
Finally, it's such a beautiful book. I love books that have a nice clean design with easy to read text and this has both. You can order it from your favourite indie bookshop or find it over at Chronicle Books.